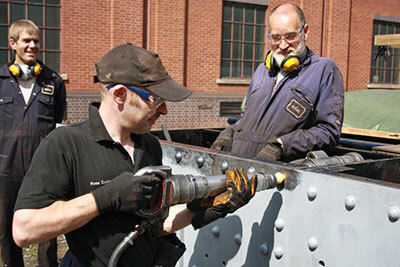 The final structural rivet has been knocked down in the rear buffer beam bringing to a close this particular chapter in the construction of the chassis. We are very grateful for the help and support provided by the SVR boiler shop and in particular Ross Cooper who has led the riveting section with enthusiasm and has been very much one of us. 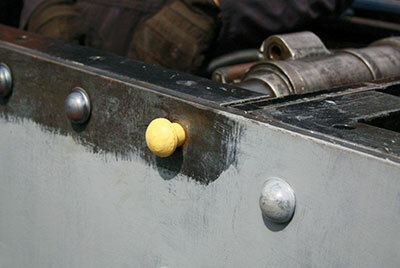 No sooner was the last rivet in place then the paint brushes were in action applying primer on the bare surfaces. The whole of the chassis is receiving a repaint to improve its appearance now that the Railway is in mid visitor season. The other lengthy job, that of axlebox machining continues. There have been several occasions when three machines manned by 82045 team members have been in action simultaneously on axlebox work, ie. vertical borer, horizontal borer and slotter. Newest recruit to the 82045 team Tony Wakely is busy fabricating the sandboxes. The bulk of the fabrication of the front pair is done with the rear ones currently taking shape nicely. We are disappointed to have to say that West Somerset Restoration found themselves unable to commence machining the cylinders due to staff issues. It was therefore mutually agreed to move the cylinders to Tees Components Ltd. at Saltburn-By-The-Sea for this work to be undertaken. This company machined the replacement right hand cylinder, cast from 82045 patterns, for 76079 on the North Yorkshire Moors Railway some months ago. We are hopeful of receiving the machined cylinders later in the year. The draw took place on Saturday 19th July at the SVR Peep Behind the Scenes event. We were aided this year by Master Joseph Ashton of Cambridge who was visiting the SVR with his grandfather. Joseph was delighted to climb aboard Sir Keith Park to make the draw. Thank you Joseph! 1. K G Davis of Great Barr, Birmingham. 2. Graham Gardener of Wombourne Staffs. 3. Joe Barrie of Bromsgrove. 4. Colin Burch of Stourbridge. 5. Alan Surman of Droitwich Spa. 6. Mike Plain of Atherstone. 7. Mr Grater of Kings Norton. 8. Mrs M Tyreman of Newcastle upon Tyne. 9. J & J Williamson of Isle of Man. 10. Clive Hinwood of Wellington Shropshire. 11. Roger Story of Northampton. 12. David Jerrom of Oldswinford West Midlands. 13. Mrs S Pearse of Bradford on Avon. The main fundraising event in prospect just now is the 15,000-foot parachute jump to be made in mid-August by SVR fitters Will Marsh and Gary Williams. Results so far look promising, with getting on for £5,000 either in the kitty or promised and everything still to play for, so please, if you haven't already done so, consider sponsoring these two chaps in their magnificent gesture to raise funds for 82045's boiler. Full details including how to help are on the right. A concurrent fundraiser is the cheap and cheerful "Footplate for a Fiver", launched at the Peep Behind The Scenes day on July 19th and available throughout the four days of the September Gala, 18th-21st September. This is the essence of simplicity: you simply fill in a little slip with name and contact details (telephone number or email address) and put it in a collecting tin; for every slip you fill in, you put £5 into another tin - so, for instance, £10 gives you two goes, and so on. On Sunday 21st September, the winner's name will be drawn and he or she, subject to the necessary conditions being fulfilled, will win a footplate ride from Bridgnorth to Kidderminster and return. Almost 33 miles for a fiver - surely worth a flutter at that price, especially if you've never been on a moving steam engine! If you can't wait for the Gala, or won't be able to attend it, you can send your details, with £5 or any multiple of it, to Chris, who will ensure that you are entered for the draw. As you will know, our efforts are now vigorously concentrated on gathering funds for the boiler and firebox, for which we need to raise about another £200,000. We are facing stiff competition out there, where bigger and more ostensibly glamorous machines are clamouring for support, so please, if you can, help us achieve our aim to have 82045 in steam in 2017 (no promises, just a realistic aspiration). Constructive ideas for raising money are welcomed and will always be given serious consideration. The article "A Willing Little Workhorse" which appeared in the June issue of Railway Magazine along with an appeal leaflet, has brought a pleasing response, with money still coming in, some of it from new supporters outside the Severn Valley Railway. Very many thanks to all of you who responded or intend to respond to this, the second phase of the Boiler Appeal - and also, once again, to Railway Magazine Editor Nick Pigott for his positive encouragement and for doing such an attractive job on Chris's article. These are all considerable amounts, but if you think you can help out, please get in touch with Chris. Ross Cooper watched by members of team 82045 poses with the symbolic 'golden rivet' before the real one was hammered home. Photos: Tony Massau. Joseph Ashton of Cambridge aboard Sir Keith Park drawing the winning ticket. Will Marsh (left), Gary Williams and 82045 on terra firma at Bridgnorth. The weekend of 16th/17th August will see the most unusual event yet in the history of the 82045 project. 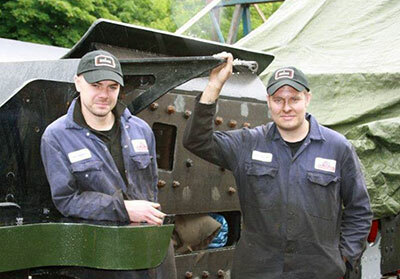 SVR fitters Will Marsh and Gary Williams will make a sponsored parachute jump to raise funds for the boiler. The jump will take place 15,000 feet above - appropriately Swindon! An initial thought is to sponsor, say, £1 for every 1,000 feet of their sickening earthward plunge and happily sponsorship is already arriving. One very kind supporter has even sent 1p per foot – a superb donation of £300! Thanks to everyone who has already been moved to support these brave lads and to all who will help in their quest to help the 82045 boiler appeal. 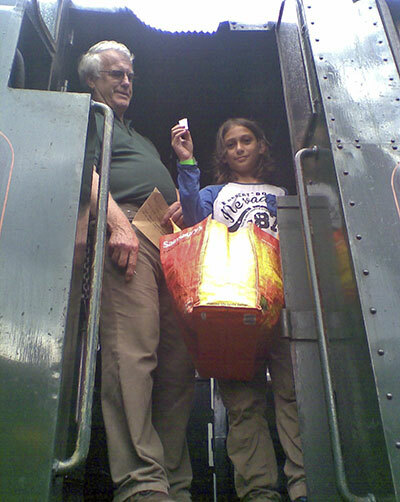 If you would like to get in early with your sponsorship - cheques should be made out to the `82045 Steam Locomotive Trust`, marked Parachute Jump on the back and sent to Barbara Massau, 4 Southfield, Prestbury, Cheshire, SK10 4XF. Alternatively, `Just Text Giving` is a simple way to make a donation. Just choose how much you wish to give (£10 for example) then text `Tank45£10 to 70070`. You will receive an acknowledgement and instructions about how to Gift Aid your donation. Thanks in advance - and thanks especially to Gary and Will for this tremendous gesture.